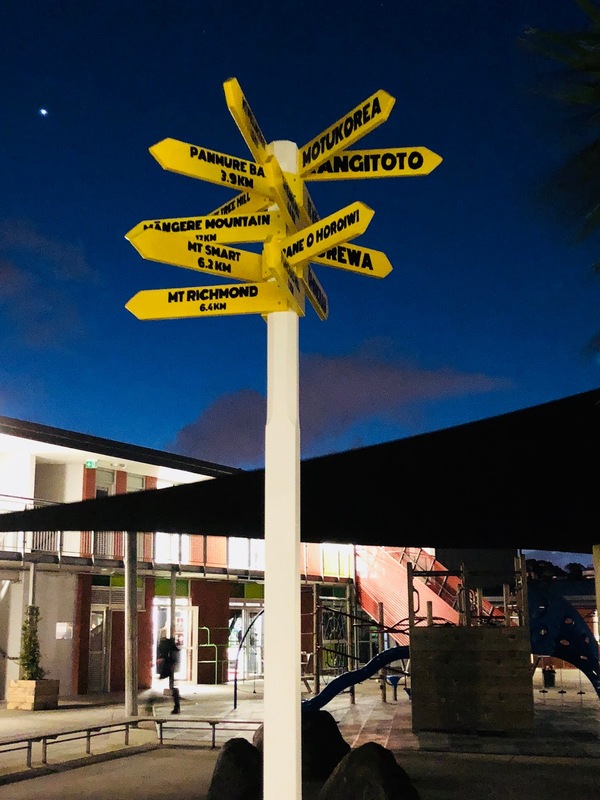 The exhibition was an opportunity for the kids to create artefacts that helped us show our current understanding of these values as well as create some permanent features around our school environment. If you have ever been to our school, you may have noticed some large rocks around our playground. 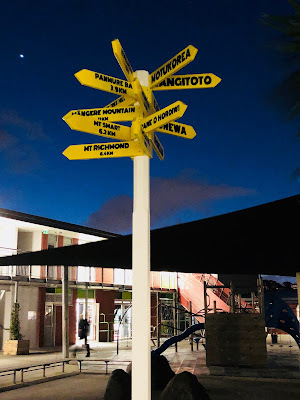 Upon investigation, the kids found out that these represented some of our local maunga (mountain) and we created a project to see what we could create to help people understand the nature and significance of these rocks. 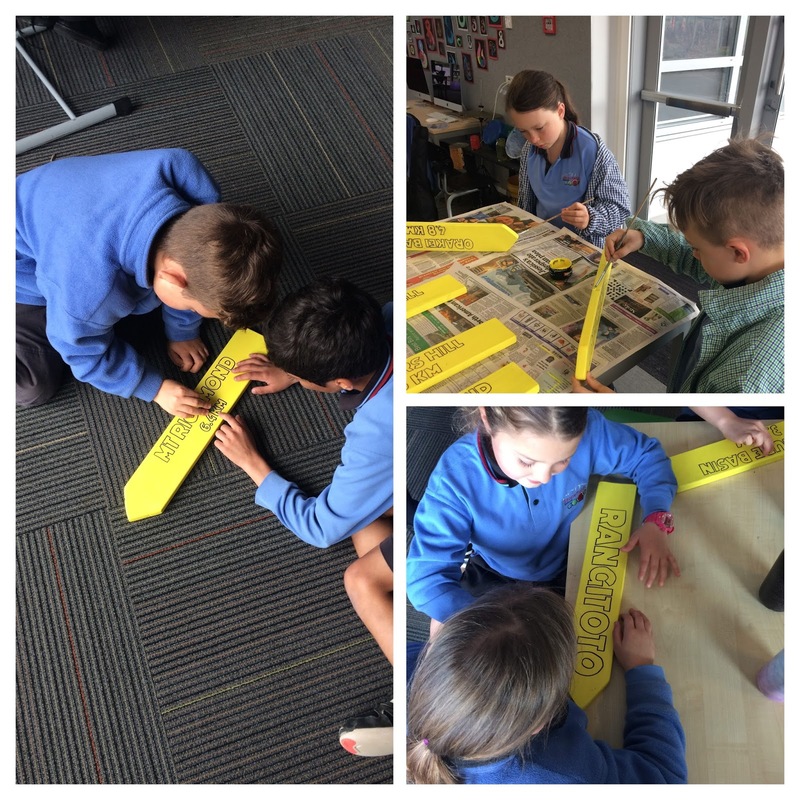 We investigated signs and a lot of the kids made connections to the AA Road Sign at Cape Reinga and it was quickly decided that they wanted to create their own sign to help people understand which each rock represented as well as how they are connected to the creation of our school - these was a theme that all our groups were investigating. Insert teacher panic here... I had managed to fumble my way through woodwork growing up but the creation of a signpost was looking daunting, however through the natural curiosity and fearlessness of the kids, I was eager to take the challenge on. We decided that our focus through this project would be bringing our best together as we knew that the group of 30 could not all possibly work on the same aspect of the project at the same time. this for us" to "I am keen to get involved myself." What did this mean? For the kids and as you will read through their reflections below, it was a lot of sanding. However over time, I got to see kids who normally would not take leadership roles within the hub find an opportunity to shine and take risks on elements on the project that they wanted to try out or felt comfortable stepping into. What was the result? The project ran to time and was executed so we had the sign up for the night of our exhibition. 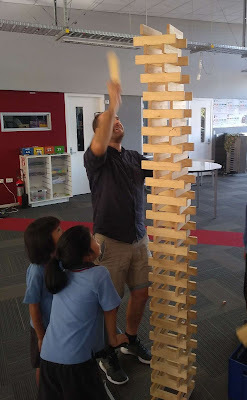 The sense of pride that the kids had when they saw the post going up was incredible and it is great to see other learners in the school start to use it. Something refreshing is that a lot of the group still have some ideas about the next iteration of this project and have seen this attempt as a first draft that they can build on as a legacy item they have created for their school. I have been fortunate enough to pick up some time with our Agency team where I spend time observing another teacher's lessons to see how they are promoting agency within their practice. Based on discussions had so far, I realised that I have been promoting aspects of agency within my numeracy programme based on the initial hunch I had earlier this year about the learners I am teaching. Student agency is something that I have been wanting to investigate more due to moving to a different year level so I am grateful for the opportunity to spend this term doing so. 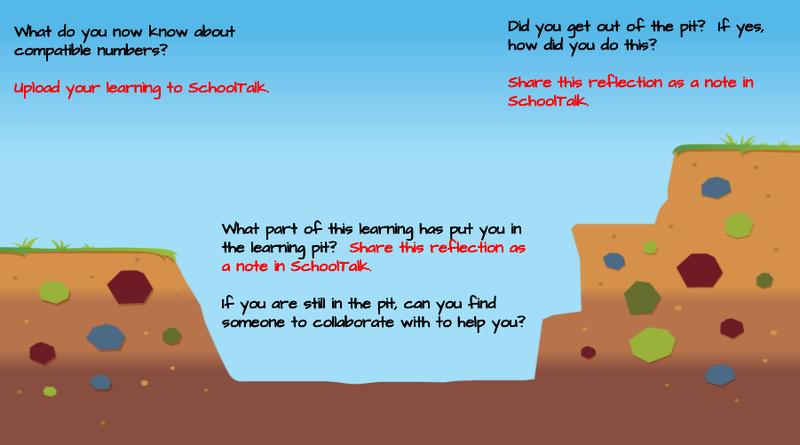 I have always given learners the opportunity to reflect in various formats however I noticed that this year I needed to dedicate specific time each session for learners to reflect on their learning. I updated my modelling books to add in a slide like the one below where I ask the learners to reflect on what part of the learning pit they found themselves in during the session. This has been going for a few weeks now so now the next steps is to build the kids confidence in the articulation of what specific elements of the learning that they are having issues with so I can tailor learning to help them with those. I am still modelling thinkalouds to boost discussion and reflection in the moment so they feel confident to discuss at any part of the lesson. 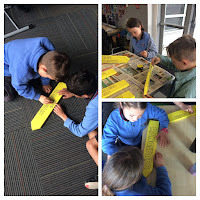 I have had some conversations with the kids and their whanau about anxiety in maths. When we discuss where this may come from, a lot of the conversations come back to some of the kids feeling surprised when we start a new unit of learning. 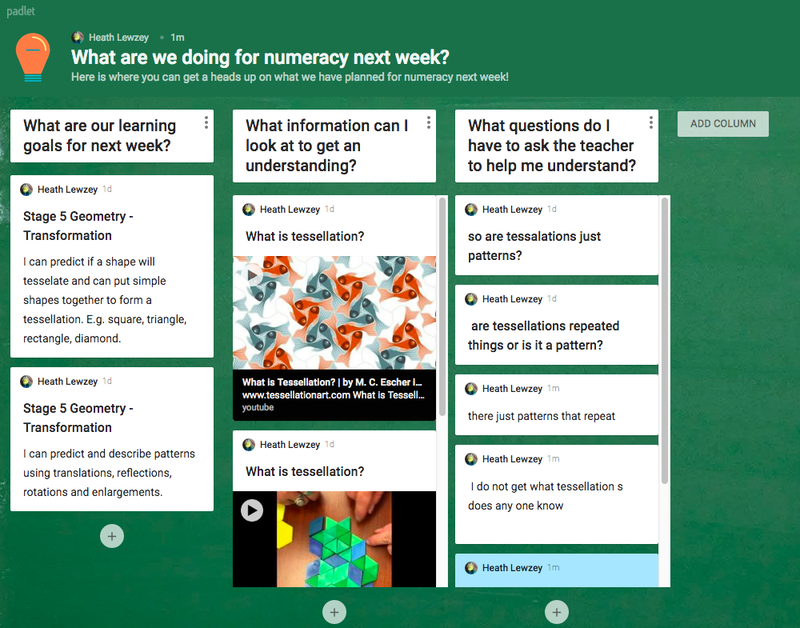 While at Claremont, I saw a wall display where the teachers encouraged questions from their learners on the next week's learning. They will display both the learning goals or main objectives for the next week as well as resources for the kids to help them to make meaning of the topic. After asking questions on the learning goals, I give the kids the option to book into a workshop based on their confidence in this topic. 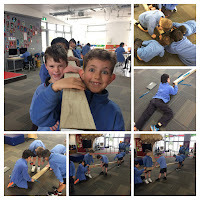 So far the kids have really enjoyed this weekly part of our learning as they are coming to the relevant workshop with a lot more confidence and the questions they ask help me tailor the learning to any specific knowledge gaps. So how has this focus on communication impacted on the kids understanding? 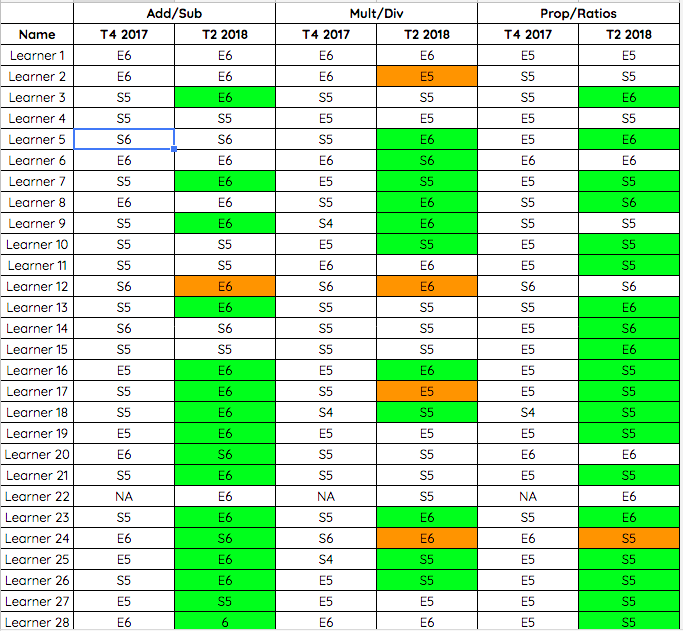 I did some analysis based on the learners' Gloss assessments from Term 4 2017 to Term 2 2018 and for the majority, they have made shift in at least one element of this assessment (green). Looking forward to working with these kids for the remainder of the year! 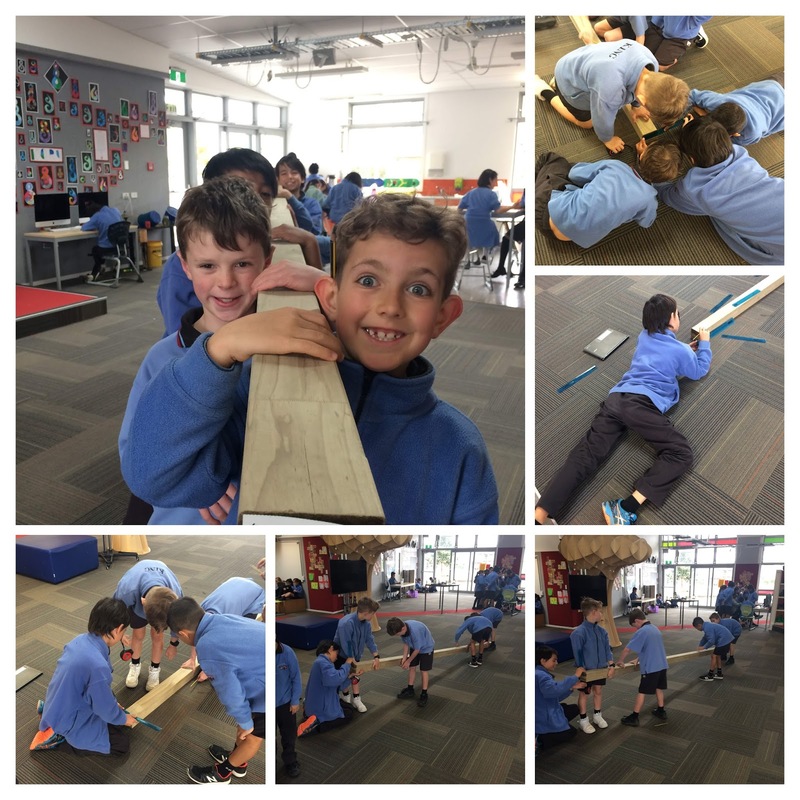 We have moved into a strand focus with looking at elements of geometry and algebra which is new to both the kids and me so I am enjoying learning alongside this group of kids as we continue to communicate with each other about our numeracy. Today my stint as a mentor teacher came to an end. It was awesome to see someone grow in both confidence and their practice and it wasn't until I had a conversation with a colleague that they pointed out that this growth was for me as well. Personally I think I should have waited another year before offering to be a mentor however as my colleague discussed with me, the insight into my current practice was invaluable for not only the remainder of the year, but my continued teaching practice. As I reflected, I found this blog post that helped me articulate how the experience had helped me grow as both an individual and a teacher. I learned that I am a bit of a control freak! I am one of those 'details' type of people who will often get entrenched in the daily grind to stop to ask those 'why' type questions that open up to the blue sky/ocean way of thinking. I have noticed that this has come back a bit more this year where I default to the "yes but..." type responses when listening to others and need to remind myself to continue to listen with purpose. Having another adult teach alongside me helped me understand the importance of relationships with the kids. Through discussion, I found myself learning more about the kids as we analysed why some lessons did or did not work for particular learners and while observing lessons, it was able to give me more insights into how I could adapt my practice to better suit the needs of the kids I am working with. I learned to make learning more fun again - again me getting caught up in the details and with Term 2 having a lot of focus on assessment, I wasn't enjoying how I was planning or some of the outputs from my planning and I can bet the kids were feeling the same way too! 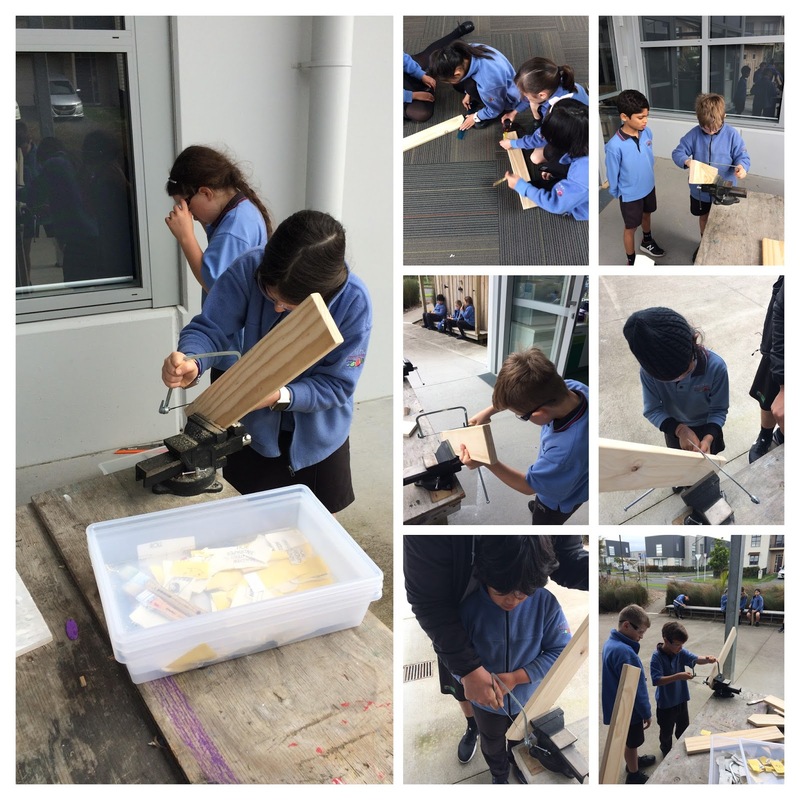 Observing lessons where the kids got to be creative or try new things has inspired me to continue to push this inquisitive nature of my practice as well as realising that it is ok for me to learn alongside the kids more so. 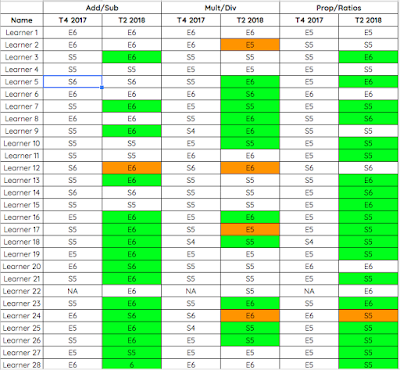 Stay tuned for how Term 3 is going to turn out - I am looking forward to it! So thank you to AUT for allowing me the opportunity to test out the mentor role - I got a lot out of the experience! This year I was fortunate to take part in the annual exchange between Stonefields and Claremont College alongside Anita. This exchange has been one that has existed for a few years now and a lot of my colleagues have visited Sydney. The intention of the exchange for the two schools to share both information and aspects of our practice with each other so Anita and I created a video as an application for the reasons why we wanted to go. Fast forward to Week Eight of Term Two and I was in Sydney at the school - the staff were amazing and set the bar high for hosting which we returned the favour next term. Both Anita and I remarked on how fortunate we were to be immersed in a school for three days and being able to capture our noticings as we moved around. So what were some of my take outs from this experience? 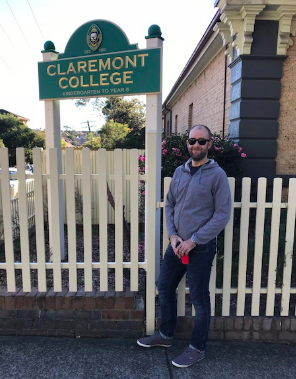 Claremont has a smaller footprint than Stonefields therefore have been really smart about the use of space in their teaching environments. The first thing I noticed was the effective use of storage - all the classrooms have been purpose built so it was great to see storage being implemented under seating, whiteboards as teaching spaces on the outside of cupboards etc. This has really made me reflect on whether I am using space to the best of my ability while teaching and how I can really get the most of the environment (ie, the initial hunch for my inquiry this year). All the classrooms at Claremont have two or more teachers in them so the potential arises for collaboration. 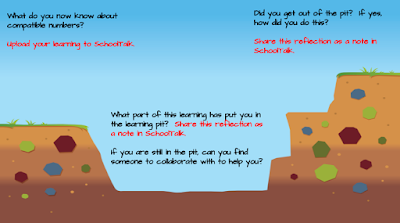 It was great to see communication happen between teachers on the fly as the learners transitioned from one subject to another and again I reflected on whether I was doing this in my practice currently. To be honest, I feel that I am teaching solo at the moment and wonder what impact it would have on the kids if we opened up the potential for more team teaching within the hub. It was great teaching alongside a student teacher these last two terms so I need to look for future opportunities for us a as hub team to work collaboratively. One of the most stand out moments for me was to see how the learners gravitated more towards practical applications of tasks rather than opting for a digital method. To my untrained eye, I first thought I was seeing a lot of worksheets however as I got to speak to both the teachers and the learners, it was made aware that these were custom made resources that scaffolded learners into tasks. Currently I am finding that the learners are opting for digital due to it being new or accessible however am I scaffolding them into these applications appropriately? I feel that I am making assumptions that we are 1:1 devices that all learning should be accessible through that forum but are there better ways to make these links more explicit as well as catering for all learners. 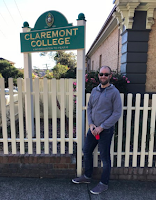 The main follow up from this blog post is to prepare for Claremont's visit in Term 3 where we continue to look for opportunities for the kids to interact with each others. They are really interested in how we bring Te Reo into our practice and it was be a great opportunity for the kids to share their knowledge with others. Lots of things to ponder as I move into the next term however the best thing was that I was able to share this experience with another teacher. Being able to discuss these areas of wonder in the moment helped me think about how I could bring some these to life when I get back into the hub. Stay tuned for more updates as I will definitely link back to this blog post with future reflections. 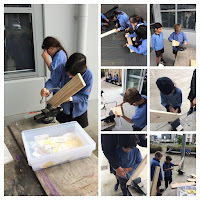 With Term 2 moving on quickly, it is time to stop and reflect on how my inquiry on how to use the environment as another teacher has been working. While I had been focusing on the space within the hub, it wasn't until last week when I had to let the kids know that we weren't be going to the library the following week that I realised how much of an impact having a regular library session each week has been building the relationship between teacher and learners as well as coming the realisation that I had been using the library space as another teaching environment. Please note this photo was not staged - this is the usual state of the group when we are in the library on Thursdays. I am getting time to learn about the kids as readers as we discuss their interests in books. I am seeing some of them take risks with the choice of books they are choosing - I have implemented a "Free Reading" Box back in the hub and we rotate each week on who gets to choose books for this box. This has allowed the kids to go and ask each other opinions about the types of books they would enjoy. I get to share some of my passion for reading with the group. 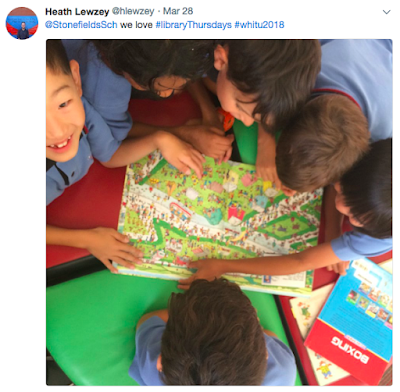 It can be pretty easy for us to get caught in the routine of learning within the hub and what the kids have said to me is that they like the fact that I sometimes can be looking for a book to read myself. I am also using this time to teach skills like researching, skimming and scanning as well as evaluating texts as we begin to locate texts for inquiry. Having this context allows the kids to be more engaged and they are able to make the connections quicker due to the environment we are in. My inquiry is changing in focus as the kids are making progress so I intend to keep the regular library session to help me explore this further. Stay tuned for the next update! 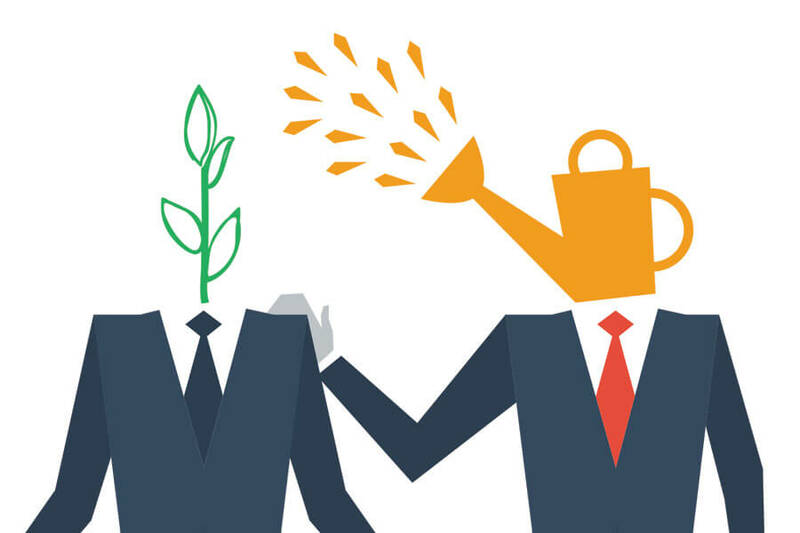 Mentor or Coach - What's The Difference? Having a strong mentor can really set up you up for success as a teacher. 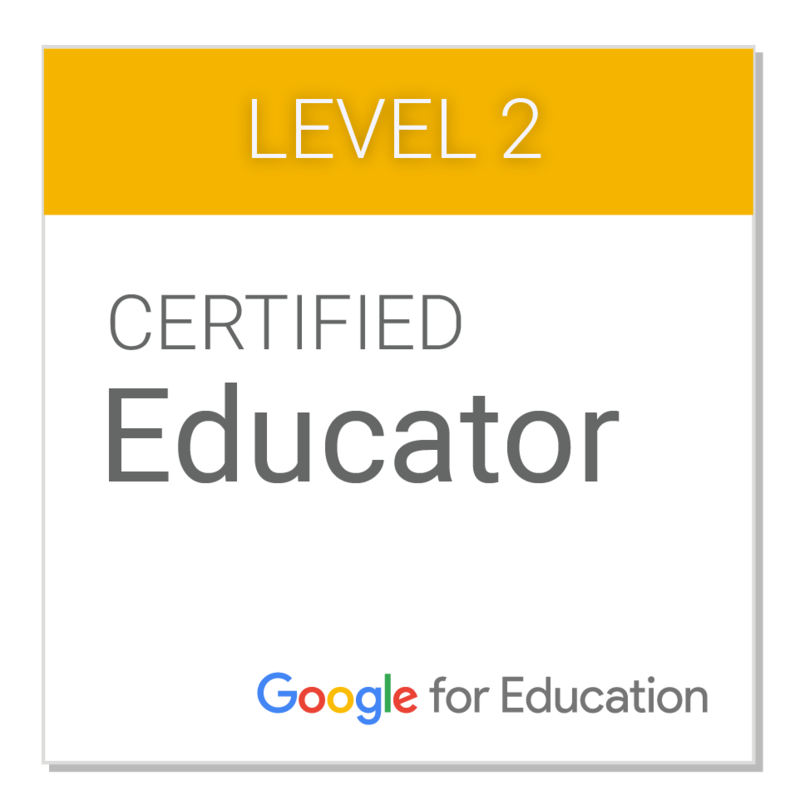 I was fortunate to have one in my first two years of teaching, especially being able to teach alongside them in my first year of teaching. Being able to observe teaching in practice as well as reflect while in the moment enabled me to feel more confident within my second year of teaching, especially when we worked in different areas of the school. My mentor inspired me to take the opportunity to apply to be an AUT mentor this year and while I am in a different year level, I think continuing to learn alongside the kids allows my practice to be more transparent to someone who is observing me. One thing I have struggled with so far is what is the difference between being a mentor and being a coach. As with any new learning, I try to understand the definition first to help me then work out my next steps. 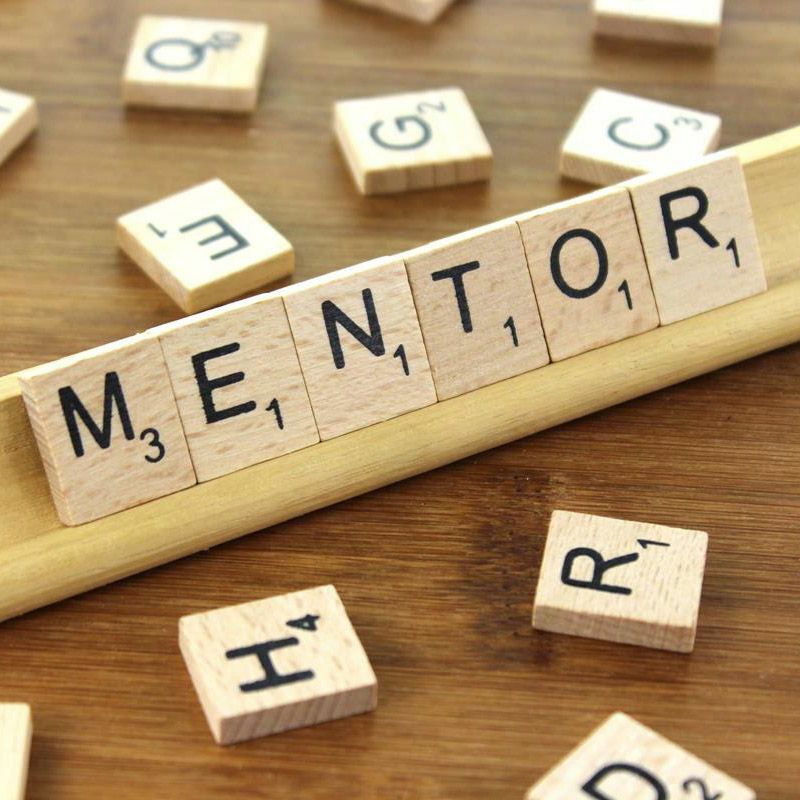 Mentor - an experienced and trusted adviser, a wise and trusted counselor or teacher, an influential senior sponsor or supporter. Coach - a person who trains an athlete or a team of athletes, a private tutor who prepares a student for an examination, a person who instructs an actor or singer. From that, my baseline understanding is that you can be coached for an end result (ie, finishing your teaching qualifications), however a mentor is someone who works alongside you rather than instructing you on your next step. The word trust really stands out for me and this is something that I have been working with being open about my practice. The conversations have been great as it helps me reflect on why I chose to teach something in a different way and I am finding it beneficial having another set of eyes in the space to pick up on things that I might have missed. Next Steps: Continue to have these reflective conversations about our practice, shift more of the control over and observe. 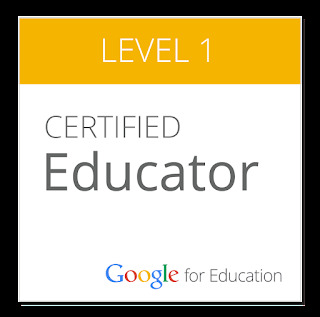 Having changed year levels this year, developing my pedagogical content knowledge (PCK) has become a priority for myself. 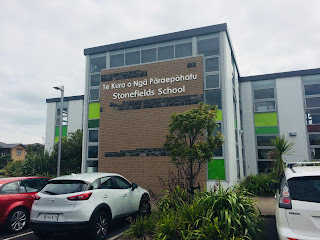 This year I am team teaching in numeracy with a group of learners operating between Level 2 and Level 3 of the New Zealand Curriculum for numeracy. This is a natural follow on for the numeracy that I was teaching in previous years and I am grateful for this foundation as I look forward to challenge myself in this space. As the learners are operating at a higher level, my first noticing goes to how we are struggling as a group to articulate our numerical thinking when asked to explain how we came to a conclusion or got a specific answer. My first instinct was to explore if there were particular vocabulary gaps within our group, however, what I am noticing more is a) a general lack of confidence with articulation of numerical thinking and b) a reluctance to do this in group settings aka 'the fear of getting it wrong in front of others'. 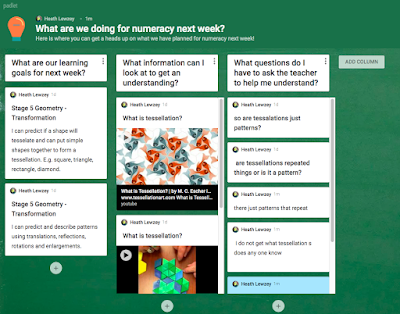 Fortunately for me, a lot of schools in our clusters are looking into this area and documenting through the use of their blogs, especially Pt England School, so it has been awesome to read and see how some of the teachers are developing these skills within their own numeracy programs. I have also found the app Flipgrid helpful in developing the learners confidence in taking risks in articulating their strategies. Learners are able to record themselves on their own device and listen back to themselves before posting the video to an online forum where other members of the group can listen and respond to the videos. This has also served as a great link with our cybersmart curriculum. Next Steps: Continue to look for opportunities to build these communication skills within our numeracy program. I also need to see if the team will let me pay for a Flipgrid membership as the free version only allows you to activate one grid at a time. 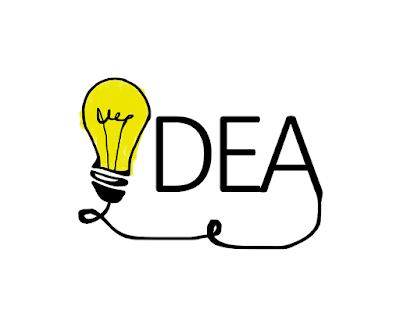 I am also going to connect with some of my colleagues at Pt England to see how they are finding their PD and what are their learnings so far. Working in an ILE, you do get used to the hum or buzz that comes with 70 bodies within one space all undertaking their learning. However for some of our learners, this can serve more as a distraction and they may seek out spaces where they a) feel comfortable and b) feel safe to take risks in their learning. So come to this year where I am operating in a learning space with 100 learners and three other teachers, it seemed somewhat wrong to try the following. I took a group of learners into one of our larger breakout spaces and I closed the door. Their faces said it all when they smiled. The transformation of the space went from hustle and bustle to a more calming vibe and the kids sensed it as soon as the door touched the wall. Now it is not my intention to close these learners off from the rest of the hub. My inquiry is focused more around how the environment can be used to foster independent learning. The "Bat Cave", as it has been named, is serving as a launching pad where learners can develop strategies to focus on their learning, rather than get caught up in the activity that is happening around them. I did something more extreme and this has put me in the learning pit. I took all the furniture out of the space (see the photos below). I am curious to see what the learners feel that need or by observation, we decide as a group is important to have in the space to help us with our learning. So far we haven't asked for much as we have been working on building the routines and structure of our literacy learning. This group is with another teacher for numeracy so we are working together to create the norms for the Bat Cave, co-constructed with the kids. We decided that we needed a whiteboard the other week - the smart board that we couldn't get working wasn't adding any value so we were fortunate enough to appropriate one that wasn't being used in another part of the school. Next Steps: I have had a few teachers come and observe me which has been great for my practice. I need to look at developing my knowledge around using the environment as the third teacher so will be exploring some of the content by Reggio Emilia. What's On Top for 2018? Recently we have been asked to build our inquiries for 2018. Given the nature of who I am as a teacher and how my brain works, I intend to embark on three inquiries this year - one being my main inquiry for the year and two smaller ones that focus more on specific elements of my practice. My main focus this year is how I can use space as another teacher within my literacy program. I will be labelling these posts with Inquiry - Environment. This goal also speaks to some of our COL achievement challenges, with particular focus on goals two, three and five. My secondary focus will be examining how I am developing learners' articulation skills within numeracy. These posts will be called Inquiry - We. This also has connections to the COL achievement challenge six. My last focus is reflecting on myself as a practitioner, especially as I am a mentor teacher to an AUT student this year. This posts, called Inquiry - Me, will be focusing on my reflections as I build my coaching ability with an adult. While I appreciate that it may seem ambitious to achieve all three, I think having the platform of my blog to help me articulate will help me document my thinking and build my reflection skills further. Resilience - a recipe for a secret sauce? "the capacity to call on tools and techniques to recover quickly from difficulties and help eliminate future difficulty"
Staying present - it is easy to get caught up with the day-to-day of the learning space and the ability to stay present is vital especially at this time of the year when you are building relationships with both colleagues and more importantly the children. A noticing I had about my own practice is that I am not giving enough thinking time when I ask questions. I often was asking two or three questions at a time so what I am trying to do at the moment is use the physical action of counting to ten on my fingers to help anchor me to that moment rather than skip ahead to the next part of my plan. Sharing my values - I reflected that in 2017 we looked at our values as a team, however I had not shared with my new team on things that I feel are important as well as listening to them to get further insight on how we can collaborate effectively. This includes making the effort to get to know the team outside of school to get that full view of my colleagues as people, rather than 'teachers'. This openness extends to how I am building relationships with the kids at the moment. This year there are a lot of kids who have not had me as a teacher and this means that I need to ensure that I am sharing who I am, not only as their teacher, but as a fellow learner. Reflection - I mentioned earlier that I was excited to continue this blog as a way of reflection however I found myself beating myself up as I hadn't blogged in four weeks. While this is a tool for reflection, it is not my only vehicle for reflection and how am I doing this while teaching to not only role model but to capture the noticings/learning as well as celebrate the successes. Exercise - I had been told not to fill the void of study with more teaching and work on maintaining the work-life balance. Given it is the start of the year, it is naturally a busy time however I am trying to stick to a routine of exercise as a way to 'switch off'. I think these are some great starting points for this year, especially as we move into looking at our inquiries for this year and gives me some short-term goals to bring into my practice for 2018. Onwards and upwards! 2018 - New Year, New Me? Like our learners, it is the first official day of school tomorrow and there is a sense of trepidation in the air as I go through preparations for this week. During our teacher only days last week, I was noticing how often I was using the word 'new' - new year levels, new team, new hub ... but does that mean I am needing to change along with these? I agree that there will be some adaptation and learning involved but I think that reason that I was noting all the different elements was due to the fact that my support network at school has changed as well as no longer having a mentor teacher. This means starting afresh with a new team so remembering to communicate and be open in order build factors like trust in our team is fundamental in this initial set up period. I am teaching in a four teacher team with 104 learners so last week was discussion about how we will use the space. What I am noticing from the four of us already is the sense of adaptability when we discuss about observing how the learners are reacting to the space and being flexible to tweak or update based on these observations and discussion. I am excited to see the learners this week as I have taught a majority of the Year 4s (as Year 2 and 3s) and Year 5s (as Year 3s) so am looking forward to seeing how the break has treated them as well as looking forward to exploring new content alongside them. The Year 6s will be a new entity to me however the first couple of days, we as teachers are sharing our identities as a lead in to our Term One concept so during this time it will give me opportunity to both reflect as well as observe. I am excited to continue blogging this year as I enjoyed the reflective element it brings to my practice and will help draw out some of the wonderings I am currently having throughout 2018. So new year, new me? Lets wait and see!